Headed to London? Don’t worry about Brexit. Just put your head down and head over to the nearest hot spot. The Council’s Midyear Board of Directors Meeting & Strategic Work Session will be held in London May 1-4, 2019. For those traveling to this enduring city, Brexit remains a question. As of press time, it is unknown how Brexit will play out—deal, no-deal, a second EU referendum? What is known is that it has been a hellish time for most citizens of the United Kingdom. As the ever-quotable, former British prime minister Winston Churchill once said, “If you are going through hell, keep going.” With the opening of new hotels, the addition of Michelin-starred restaurants and the proliferation of fashionable bars devoted to the national pastime of sipping gin, it appears this is just what Londoners are doing. L’oscar, a new hotel housed in the high-end neighborhood of Holborn, has just opened. French hotel designer Jacques Garcia has applied the sumptuous aesthetic he employed at the NoMad in New York and La Réserve in Paris to transfigure a baroque-style former church into a posh place to lay one’s head. The Mandarin Oriental Hyde Park London has reopened after the most extensive restoration in its 115-year history. Internationally renowned designer Joyce Wang took inspiration from the building’s Edwardian heritage, the beauty of Hyde Park and the glamour of the Golden Age of Travel to create elegant interiors, befitting the London landmark and its reputation as a hotel for royals. With ever-changing special exhibits, even at London’s 1,000 galleries and renowned museums, what is old is new again. “Edvard Munch: Love and Angst” will be on display at The British Museum through July 21, 2019. Tate Britain is presenting one of the largest collections of Vincent van Gogh’s work to be shown in the United Kingdom for nearly a decade through August 11. 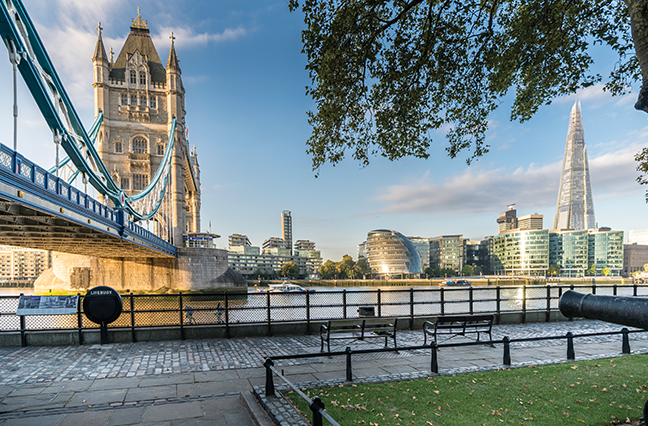 However, with the 75th anniversary of D-Day being commemorated on June 6, 2019, make time for a visit to the Churchill War Rooms, one of the five Imperial War Museums. Churchill and his war cabinet plotted the Allied victory during World War II at this underground labyrinth of rooms below Westminster. One needn’t look back in history any further to understand how Londoners will always continue to keep going in the finest fashion. Such was the observation of English writer Daniel Defoe about London during the “Gin Craze” of the early 1700s. Last year, gin sales reached more than £2 billion, and almost 50 new distillers opened in the United Kingdom, evidence the country is in the midst of Gin Craze 2.0. London is still home to Beefeater Gin, first produced in 1876 at the Chelsea Distillery. However, many new distillers are making small-batch artisanal gins, thanks to the founders of Sipsmith gin (the Houses of Parliament official gin). They led the fight to change the laws enacted in 1751 to stem the effects of overconsumption, one of which was the requirement to have a 1,800-liter pot still, a challenge for today’s craft distillers. Join in the gin revival at these fashionable gin joints.